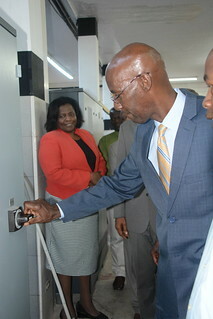 Above: Chairman, Pastor Everett Brown, activates the new press during the dedication ceremony, while members of the Board and staff of NCU Press looks on. Machines in motion were like music to the ears of the attendees as they turned the heads of those who stopped to touch and dedicate the new Northern Caribbean University (NCU) Press. NCU recently acquired the long awaited, and what seems to be highly coveted multi-million dollar, Heidelberg Speedmaster printing press. This German-made equipment really packs a punch. The NCU board and workers from the University Press took time out on July 17, 2018 to officially dedicate the new machines to God and seek His divine protection and blessing. Chairman of the NCU board, Pastor Everett Brown, charged the NCU Press workers then moved on to offer the dedicatory prayer. In his brief discourse, he alluded to the fact that though the machines are integral to their effectiveness and efficiency in serving the Jamaica Union Conference of Seventh-day Adventists and NCU, it is the service of the workers that gives value to the machines. He stated, "Every evangelistic flyer that you do, every book that you print, every minute that you spend here is a part of the overall process of building up the body of Jesus, and the service that I give as chairman of the board, the service that I render as pastor, is not more important than the service that you give as a worker of the Press". He concluded, "Ultimately, when our service on earth ends and we will have to stand before God, no machine will stand before God".